Collectibles, Etc. | Owning a comic shop. How awesome is that? Every year there’s an event called “The Diamond Summit”. This is the single biggest yearly event for comic retailers because this is where my distributor, Diamond Comics, brings all the major publishers together so that they can sell us on the upcoming year’s events and products. If you want to meet Bob Wayne, DC’s Senior VP of sales, it can be done here. If you want to have a beer with Dirk Wood, IDW’s VP of marketing, it can be done here. This is an amazing event that is soooo wonderful that I’ve hopped into a car and driven 9 hours through the setting of Deliverance to be there. One year I forced myself to get on a plane and fly to Vegas to attend this event…and then watch show girls and drink beers while enjoying the Blue Man Group perform. I know, I know…it’s a tough life. Have you ever wandered into a store and it looks like, at any moment, a chicken and a pot belly pig with mud between its toes would walk out from behind the new comic rack? Now I’ll be the first to admit that my store isn’t the most pristine. You won’t be able to eat your lunch off the floor (unless you like picking dirt and hair out of your lunch). But I will state that my store is regularly swept and occasionally mopped. The aisles are straight and the lighting is good. Nothing sours my shopping experience more than when I walk into a comic shop and the place is just filthy. 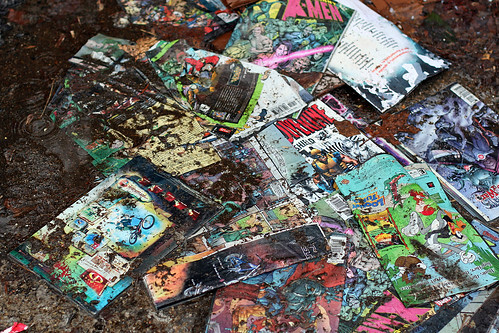 Old food containers, giant dust bunnies, weird stains on the floor and vermin do not belong in a comic shop. It’s all about first impressions and if someone walks into your shop and their first concern is if they’ve been vaccinated recently then they probably won’t come back. Take pride in the appearance of your shop. If you don’t, no one else will. My second point is organization. If I take the tour through your shop and can’t figure out where things are then you are going to miss sales. Most people are, by their nature, non confrontational and non communicative. If they don’t see what they want they probably aren’t going to ask for it. They’ll wander around and then leave if they can’t find it. You’d be amazed at the percentage of comic shops that look like a flea market got caught up in Dorothy’s tornado and then vomited its contents into a shopping center. Boxes stacked on things stacked on books stacked on more boxes. Somewhere at the bottom of the stack of disarray will either be fresh compost or a sentient evolved society of dust mites. Both of these points lend themselves to the old “first impression” theory…people aren’t comfortable if they think they’re walking into a landfill and if they’re uncomfortable they probably aren’t going to spend money or even enjoy the experience. Nice post. That’s why I enjoy your store so much. It’s clean, simple, and easy to move around in unlike…. you know… that one comic shop that happens to be located near St. Joseph Hospital (I’m not going to name names) Still, one word of advice. I find it extremely difficult to look through the graphic novels on the last section near the wall. I don’t see any order to them, and you no longer stick $5.00 stickers on the spines so I can’t instantly see all of your $5.00 books any more. And some don’t have stickers so does that mean they are fully priced? If so, why aren’t the fully priced books with the rest? I noticed a Fantastic Four Essential #2 book was pretty worn. Is that your Used section? If so, then shouldn’t it have had a sticker which said so and a lower price? That’s the only thing I would change… well, aside from organizing your $.50 books. I would so love it if I could look through the books in alphabetical order and find a series I am looking for without browsing through every single box. That last selection is the “liquidation/blow out el-cheapo trade” section. The problem with the glossy coating on most trades is that my price stickers won’t adhere very well. I’m frequently finding 5 dollar price tags laying all over the floor. Every book in that section should be either 5 dollars or less for soft covers or 1/2 price or less for hardcovers and, in theory, they should all be marked. As far as keeping the 50 cent books organized I used to do that way back in the day. I’d have someone spend 5-7 hours a week just keeping the books in some semblance of order…but it would take a few kids about 15 minutes to wreck that order. It got so bad that it wasn’t really time efficient to have someone on that level of organizational duty. Either I could pay someone a bunch of money each week to keep the 50 cent books organized and have to raise the price to a dollar a book to make up for the expense OR I could just let chaos take over and keep it at 50 cents an issue. Cleanliness, is a huge deal. Especially in a smaller business retail environment. Just b/c you may be running a store out of a basement, doesn’t mean it needs to look like it is “Your” basement. No pizza boxes or disorganized crates of miscellaneous crap from the 8 track era. Also air freshener is a big plus. Best damn comic store period.